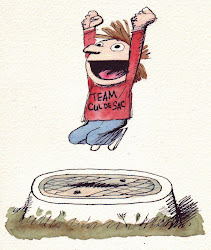 Remember, you can buy Richard's latest book, Compleating Cul de Sac, now. "I've also been looking closely at the aforementioned book of Goya's etchings, Ronald Searle's remarkable drawings in The Second Coming of Toulouse-Lautrec, and The Art of Richard Thompson. For me, Thompson's work has the capacity to conjure both inspiration and despair. I take it in small portions, no more than three or four pages at a time so as not to give up hope entirely." - Illustrator Profile - John Cuneo: "The act of making marks on paper is a rare and singular pleasure"